What Makes a Good Catfish Rod? Catfishing is a sport that requires patience, skill, and strength. These well-loved bottom feeders can grow to monstrous sizes and will put up a fierce fight to keep you on your toes. Catfish are found all over North America in bodies of freshwater, recognized by their iconic “whiskers” known as barbels. If you’ve felt the urge to attempt to catch a catfish in your local river or lake, there are many things to keep in mind when it comes to choosing a rod. Catfish rods have specific qualities that make them different than regular rods, especially in length, materials, and power. All good catfishing rods should have some specific attributes that will make them perfect for pulling in freshwater bottom feeders. Rod Length - Typically, great catfishing rods will be more lengthy than a typical fishing rod. There are several reasons for this. Rods with more length offer greater distance and casting accuracy. In addition, the length gives you more control over the fish, which is very important in catfishing as they will put up a fight. Rod Material- There are many factors that come into play when selecting rod material, but good catfishing rods should be made of graphite, E-glass, S-glass, carbon fiber, or a composite. Handle Material - Great catfishing rod handles should be made of cork, foam, or composite cork. Preference will come into play here, but typically cork is the most popular due to its comfort and durability. Handle Length- Similar to rod length, having a longer handle will give you much more control over your catch. Extra space allows for a two-hand hold and plenty of leverage. Power- Rod power correlates with the strength of your rod. Depending on the species of catfish you’re hunting, rod power will differ. In general terms, great catfishing rods should have either medium (M) or medium-heavy (MH) power. The combination of these attributes will make for a catfishing rod that’s sure to get the job done. Remember to think about the species of catfish you’re fishing for, the body of water you’ll be on, and your budget before making your purchase. Catfish rods differ in material, size, and appearance. Graphite rods are lightweight and very sensitive, which means you’ll feel even the slightest nibble from a catfish. They are great for catching small catfish that live in rivers and shallow bodies of water. However, they tend to be less durable and can break easily if you come across a trophy fish. E-Glass and S-Glass rods are the workhorses of the catfishing world. They are very similar, but S-Glass tends to be more powerful than E-Glass. Both are powerful, durable, and not likely to crack under pressure. These attributes make them great for fishing blue and flathead catfish, which tend to be larger and more powerful. Because of the rod’s durability, however, they lose the sensitivity that lightweight rods have. Composite rods are a combination of graphite and S-Glass. This offers catfishers the best of both worlds; sensitivity from graphite, and a durable backbone from S-Glass. Unfortunately, these rods tend to be more expensive. Durability: Catfish rods are very durable compared to standard fishing rods, which is necessary for the sport of catfishing. Because you’ll be competing with powerful, often large, fish that like to fight, having a rod that will last is very important. Power: Similar to durability, catfish rods tend to be more powerful because of the fish they are designed to catch. Design: In comparison to standard fishing rods, catfishing rods are long, ideally up to seven to ten feet. This makes it easier for the fisher to control their catch and also the accuracy and length of their cast. Typically, standard rods will only be around six feet long. Longer handles allow for management of catfish because they’re typically found at the bottom of a body of water where having leverage on your rod is very important. Because there are so many different aspects that come into play when choosing the perfect catfishing rod, we’ve compiled a list that does all the hard work for you. Keep in mind your own needs before purchasing your rod. Success will depend on the type of catfish you want to catch, your budget, and the place you’ll be fishing. ​This rod is a favorite among anglers for many reasons. Measuring in at 7’6”, it’s an ideal length for catfishing and will offer the maximum amount of control over your fish. It’s also a composite rod, with a blend of E-glass, S-glass, and graphite. This means that it is lightweight but also durable enough to catch larger fish. Its medium-heavy action will give you the power you need to pull in giant catfish with ease. It’s also gorgeously designed with chrome-plated stainless steel guides. This rod is great for anglers who plan on fishing for larger species’ of catfish, but can also work for those fishing for smaller catfish. It’s fairly lightweight, but still has the power needed to make it durable. However, this rod is fairly stiff, which is more easily damaged than more flexible rods. This heavy duty catfish rod handles monstrous bottom feeders with ease. A composite blend of E-Glass, S-Glass, and graphite, it gains major durability and power points while still managing to stay relatively lightweight. 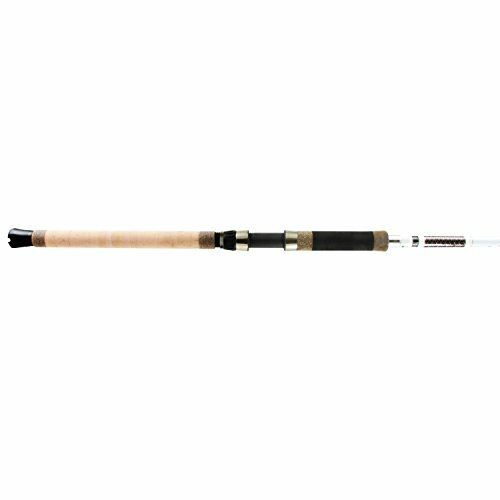 This rod was made with battling big fish in mind; it’s EVA foam handle allows for maximum control and balance in high-pressure fish fights. It’s also got some extra length, measuring in at eight feet. This is a beautifully designed rod with the power to pull in the largest sizes of catfish. You won’t have to worry about this piece breaking or bending, even if a fifty-pound fish is on the other end. Because of the rod thickness, it’s tougher to detect bites from smaller catfish. This rod works best for trophy fishermen and those looking for larger species of catfish. If you’re looking to exclusively catch smaller fish, skip this one. This rod might be called ugly, but it works beautifully. This rod has earned popularity among long time catfishers for a multitude of reasons. This casting rod comes in two models, a seven-foot version and an eight-foot version. The eight-foot version is a two-piece rod, while the seven-foot is one piece. Its medium-heavy power makes it great for pulling in catfish. Its length allows for long casts with controlled accuracy. The Ugly Stik Casting Rod is a great starting catfish rod for beginners. If you’re planning on dipping your toes into the catfishing world for the first time, this is a great place to start. The price is cheaper than average for eight-foot rods and has a seven-year warranty as an added bonus. This rod is sensitive enough to detect smaller fish but also won’t break under the pressure of a larger cat. If a two-piece design isn’t for you, avoid the eight-foot rod. The KastKat catfish rods are made with 100% S-Glass. This means they have strength and lifting power that other rods lack. Made to handle large fish, these rods won’t fail you in a battle with a giant. There are several length options to choose from ranging from seven-foot spin rods all the way to nine-foot casting rods, each having either medium-heavy or heavy power. All feature durable stainless steel double-foot guides and reinforced nylon reel seats. KastKat catfishing rods are a great choice for trophy fishers. Because they’re built with the strongest material available for catfishing rods, they will hold up over time, even after fight after fight with these monsters of the deep. This brand does tend to be a little bit pricier than other rods available and is less lightweight than rods made with graphite. 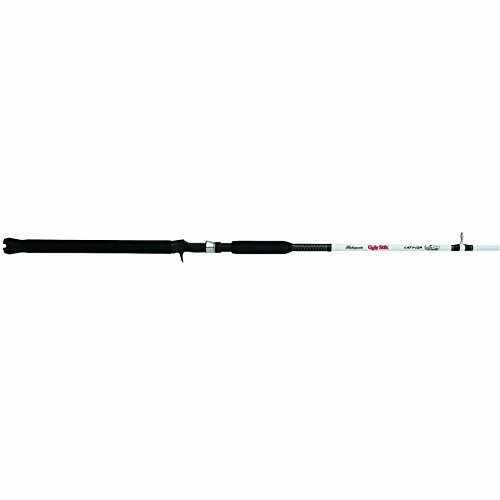 The Okuma Battle Cat Catfish rod is a luxury piece, beautifully designed for fishers with a little more experience. 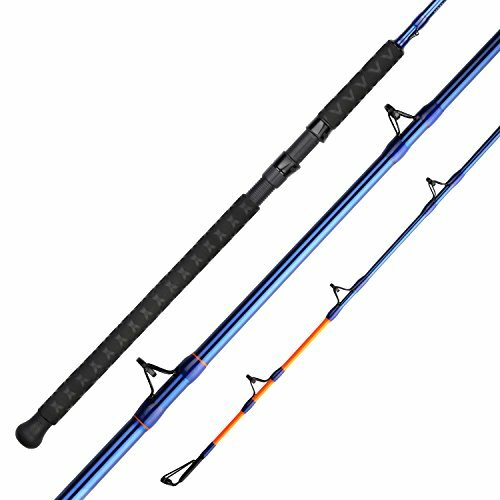 This professional rod features E-Glass structure along with durable double-foot, welded stainless steel guides. Its extra long handle provides an EVA foam foregrip for comfort and a cork-rear grip designed to avoid binding in rod holders. There are three different sizes available, 7’6’, 8-foot, and 10-foot, all with heavy power. Battle Cat rods are great for the more experienced catfisher looking for trophy catches. If you’re a first-timer, skip this one; there are more user-friendly rods that will have a similar effect. This rod is great because it has the ability to hook big fish with ease and strength, and has many added attributes that make it admirable. Not many catfishing rods feature a hook keeper or a two material rod handle. Taking care of your catfish rod is an important aspect of making sure you get your money’s worth. Generally, never let your rod strike against hard surfaces. If you lay your rod directly on the ground, you risk having someone step on it. To avoid accidentally breaking off the tip of your rod, always carry it horizontally with the tip facing backward. Be conscious when transporting your rod; never place it where there is a potential for it to be damaged by something else (in the back of a crowded truck bed, trunk, etc.). To clean your rod, sponge the rod with warm, soapy water. Rinse off with hot water and leave to dry thoroughly on a rack. Never lean a pole against a wall for an extended period of time, as it can result in unwanted bends. For a thorough cleaning, take a q-tip and ensure that all guides and ferrules are free of dirt and grime. Catfish tend to be curious, resulting in quite a few bites. Using a catfish rod is very similar to using any standard rod. Because these fish like to lurk on the bottom of bodies of water, a slip sinker rig is arguably the most popular set-up to catch a catfish. It’s fairly uncomplicated and versatile. This rig is created by threading a sinker on the main line followed by a bead. This main line is tied to a swivel; the other side of the swivel is followed by a foot-long leader and hook. As always, ensure you’re being as safe as possible by being aware of your surroundings when casting to avoid hooking a power line, foliage, or your friends. All catfish have a sharp spine on their dorsal and pectoral fins which contain a venom that can result in a hospital visit; be careful when unhooking and always keep away from children and pets. Spending money on a catfishing rod can be a daunting task. There are so many things to think about during the process, and if you’re looking for the best of the best, there really isn’t a clear winner. However, all these recommendations are champions in their own ways. Remember to think about the species of catfish you’ll be hunting, your own skill level, and the amount of money you’re willing to part with when you make your decision.